Buy 36 or more for $12.34 each. Making something beautiful in a broken world can be harrowing work, and it cant be done alone. Over the last twenty years, Andrew Peterson has performed thousands of concerts, published four novels, released ten albums, taught college and seminary classes on writing, founded a nonprofit ministry for Christians in the arts, and executive-produced a filmall in a belief that God calls us to proclaim the gospel and the coming kingdom using whatever gifts are at our disposal. Hes stumbled along the way, made mistake after mistake, and yet has continually encountered the grace of God through an encouraging family, a Christ-centered community of artists in the church, and the power of truth, beauty, and goodness in Scripture and the arts. Through stories from his own journey, Andrew shows how these principles are not merely helpful for writers and artists, but for anyone interested in imitating way the Creator interacts with his creation. This book is both a memoir of Andrews journey and a handbook for artists, written in the hope that his story will provide encouragement to others stumbling along in pursuit of a calling to adorn the dark with the light of Christ. Andrew Peterson is an award-winning singer-songwriter and author. The second book in his Wingfeather Saga, North! Or Be Eaten (2009) won the Christy Award for Young Adult Fiction, and the fourth, The Warden and the Wolf King (2014) won World Magazines Childrens Book of the Year in 2015. In 2008, driven by a desire to cultivate a strong Christian arts community, Andrew founded a ministry called The Rabbit Room, which led to a yearly conference, countless concerts and symposiums, and Rabbit Room Press, which has published thirty books to date. Hes been married for 24 years to his wife Jamie, with whom they have three children. His eldest is an animation student at Lipscomb University, his second son is a touring drummer and record producer, and his daughter recently released her first album. In his spare time Andrew keeps bees, builds dry stack stone walls, gardens, draws, and sleeps. 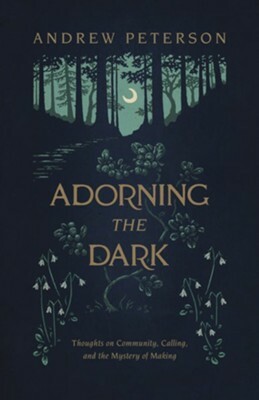 I'm the author/artist and I want to review Adorning the Dark: Thoughts on Community, Calling, and the Mystery of Making.